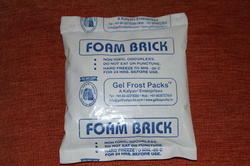 Providing you the best range of polar brick gel frost pack and cold foam bricks pack with effective & timely delivery. 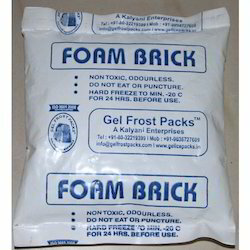 We are offering Polar Brick Gel Frost Pack. It offers superior cold chain assurance when transporting temperature-sensitive products. They are a consistent, uniform structure that is maintained and does not change shape even after freezing. Our Polar Brick Gel Frost Packs are Vacuum-sealed in durable LDPE pouches to provide greater performance and are ideal for close fitting packaging configuration. Made of Phenolic Foam and superior in cold retention, the Cold Foam Bricks Pack outlasts all our other refrigerants due to an even rate of heat absorption, ideal for tightly fitting packaging configurations. Globally popular because of its ability to retain its shape, light weight and excellent cold retention properties. Ideal for tightly fitting packaging configurations, the thermal mass of the foam coupled with interior insulation ensures the stability of the refrigerated temperature system, preventing freezing temperatures and any sudden temperature changes tightly fitting packaging configurations, the thermal mass of the foam coupled with interior insulation ensures the stability of the refrigerated temperature system, preventing freezing temperatures and any sudden temperature changes. Best used for logistics of fresh foods, lab samples, stem cell tissues, vaccines, fish, seafood, meat, fruit, flowers, etc Minimising heat exchanges will depend on a host of factors such as size of the foam brick, type of packing box used, ambient conditions etc.